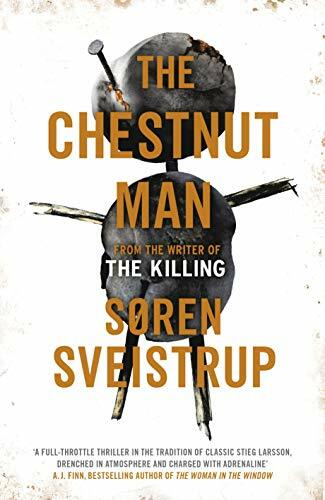 Welcome to my stop on the book tour for The Chestnut Man by Søren Sveistrup. My thanks to the author, to Jenny Platt and publisher Michael Joseph. The police make a terrible discovery – a young woman is found brutally murdered, with one of her hands cut off. Next to her lifeless body hangs a strange doll made of chestnuts . . . Assigned to the case is young and ambitious detective Naia Thulin, and Mark Hess, a burnt-out investigator who has just been kicked out of Europol. Struggling for leads they come across a mysterious piece of forensic evidence that doesn’t quite fit. It points to a missing girl, presumed dead – the daughter of politician Rosa Hartung. But a man has already confessed to her murder, and the case is long since closed. The body count keeps rising, as another woman is found murdered. Once again, a chestnut man is found with the victim. Thulin and Hess need to make the connection between all three crimes, and fast, because it’s clear the murderer is on a mission that’s far from over . . . Fans of The Killing, The Girl with the Dragon Tattoo and Jo Nesbø will love this debut thriller. This is a debut by Soren Sveistrup who is the man behind the smash hit Danish series The Killing. Which sadly I haven’t seen but want to now after reading The Chestnut Man. The book reads like a movie, it is non stop action from start to finish. The gory details from the beginning let you know that this book is not for those that like their crime fiction cosy. Now I wouldn’t say I am squeamish in nature when reading about murder scenes etc in books. I am a huge fan of the Perfect series by Helen Fields which is probably the most graphic I have ever read. Then Sviestrup comes along and with the gore yes, for sure but also this uneasy creepy factor. We meet Detective Naia Thulin and Detective Mark Hess in the book and I really enjoyed both characters. They both had hints of their own lives threaded throughout the book. Which was really refreshing, we were drip fed little important facts. As opposed to long chapters of the characters lifestyles away from the case. We follow Thulin and Hess as they try to solve a plethora of cases and what on earth as these little Chestnut Men? Excellent writing that really draws you in and I had no clue how it would end. Which I love, you really have to come out of your own head and go with the flow of the book. Otherwise you will just go nuts. I always say this when I love a book but I do hope this is the start of a series. I would like to see what happened with Thulin and Hess further down the line. My only critique would be that I felt the end was a tiny bit rushed. But apart from that, it was tick tick tick all the way. 💫💫💫 Good, worth adding to your TBR. 💫💫💫💫💫 AMAZING, buy it today, I loved it.